Bring easy medieval flair to your home or office decor with the Mini Medieval Tournament Helmet. 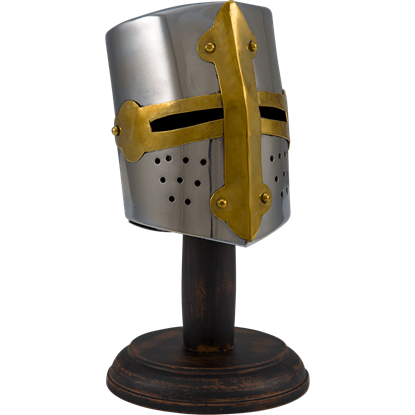 This mini knight helmet has a traditional great helm shape with a flat top, and its face is accented with a bold, brass cross. The might of a Roman soldier can lend you strength any day when you accent your shelf or desk with the Mini Roman Helmet. 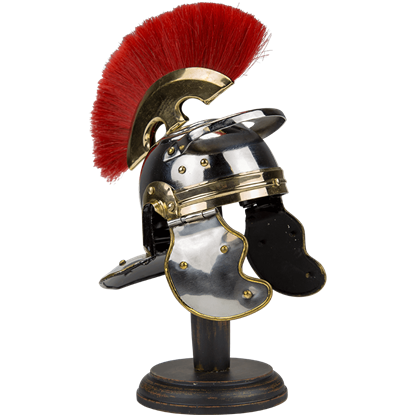 This miniature collectible helmet is finely detailed and made of steel with a chrome finish and brass detail. See the latest product video demos and stay updated on events, DIY- guides, competitions and lots of fun and relevant LARP stuff. Have a business in North America? Become a Dealer for the Epic Armoury Brand. Copyright © 2019 LARP Distribution. All rights reserved.